Emmet Cohen will perform in honor of Rabbi Clifford Kulwin’s upcoming retirement from Temple B’nai Abraham. Cohen will be performing and discussing Jews and their jazz influences on Sunday, March 24. The event kicks off Temple B’nai Abraham’s (TBA) celebration of Rabbi Clifford Kulwin, who will be retiring from the Livingston synagogue at the end of June. Cohen, 28, sees numerous connections between jazz and Jewish culture. Cohen said the timing was perfect as jazz spread from the south to major cities up north, where Ashkenazi-Jewish musicians, such as Benny Goodman and Newark-native Willie “The Lion” Smith, lived. There were cultural affinities as well between Jews and African-Americans, who were at the forefront of the jazz movement. “Jews can relate to the struggles of oppression and hate experienced by African Americans,” Cohen said. Kulwin was introduced to jazz by the band director in his Champaign, Ill., high school. In fact, he told NJJN, in 1973 his jazz band won best in the state of Illinois; at the time, Kulwin played tenor saxophone. Now, he said, he plays jazz piano “enthusiastically, if not terribly well,” and listening to jazz is one of his favorite pastimes. As for Kulwin’s post-retirement plans, he intends to spend time in Brazil, where he was a rabbi in the early 1980s. Kulwin speaks fluent Portuguese. For two weeks in July he’ll be covering for a rabbi on sabbatical in Sao Paulo. Upon returning to the Garden State, he said he plans on recruiting volunteers for Big Brothers Big Sisters of America, where he is on the advisory council of the northern New Jersey section. 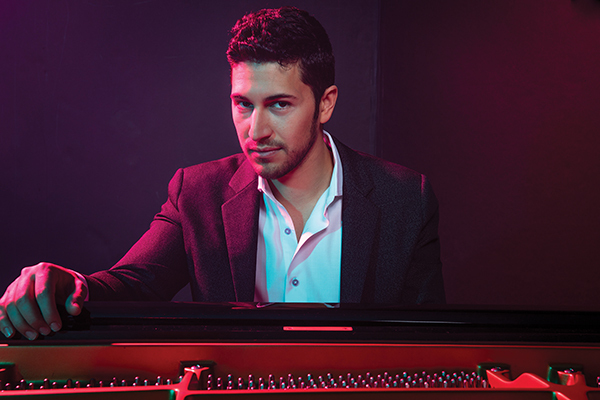 Cohen’s musical journey began when he was 3 and had an affinity for the piano. Initially he was taught classical piano using the Suzuki method, which teaches students how to play by ear, but as he got older he learned to read sheet music. Around age 12 Cohen got bitten by the jazz bug when his father took him to New York City to hear prominent artists such as Charlie Parker, John Coltrane, and Ray Charles. Cohen received a master’s degree from the Manhattan School of Music and a bachelor’s from the University of Miami’s Frost School of Music. He has won numerous jazz pianist competitions and garnered accolades from the international jazz community. Along with being a solo artist and fronting the Emmet Cohen Trio — comprised of himself on the piano, a bassist, and drummer — Cohen is a music educator and curator of multidisciplinary arts curricula. He encourages his students to be receptive to their audiences.